All transactions are safe and secure with a reliable history in online purchasing behind each of our associates. Buy the Storm Shadow Costume Hoodie t-shirt to own G.I. Joe clothing and merchandise. In the case of this Storm Shadow costume design, it's what's on the outside that counts. These Storm Shadow G.I. 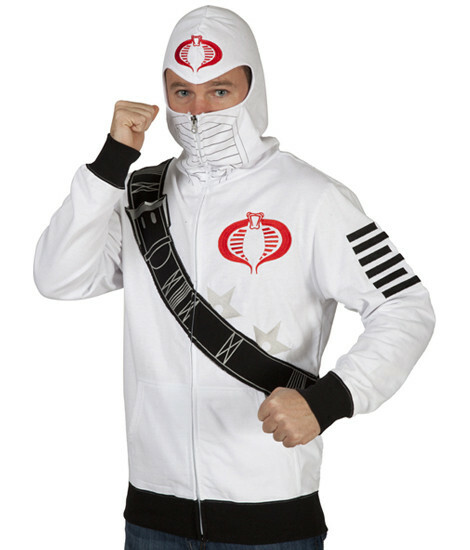 Joe t-shirts and hoodies reveal the enemy soldier's Arashikage ninja clan symbol on the sleeve, in addition to displaying his white ninja uniform and weapons on the front. Before his friend joined the side of the good guys, Storm Shadow hung out with his buddy from Vietnam, Snake Eyes, along with the wolf Timber. Capture the attention of everyone around you in this unique G.I. Joe t-shirt or hoodie disguise that is a creative addition to this gallery of G.I. Joe clothes and merchandise. In addition to the Storm Shadow Costume Hoodie tee above, browse the G.I. Joe Clothing Gallery for more apparel like men's and women's clothes, kids shirts or hoodies.